Iowa workers are falling behind while lawmakers drag their feet on raising the state's minimum wage. 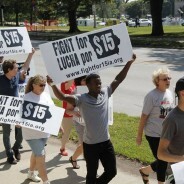 A new report shows that Iowa workers need close to $15/hr just to make ends meet, lining up with the national "Fight for $15" movement spreading across the country. Contact the Government Oversight Committee! Satyra is a single mother of three. This is her take on why Iowa needs a living wage. Iowans cannot survive on $7.25. We need $15 an hour. This is why.